When a few hours ago I read about the new Nintendo 2DS on Twitter, I immediately thought that it was an hoax: a new "portable" console to play 3D games on a 2D screen, with a wedge design that makes impossible to place it in a pocket and play outside home! After the great success of the giant tablet-gamepad on the WiiU, the great design genius strikes again! What do you think about it? For me it's ridiculous, it's huge, for just a few dollars more you could take the original 3DS, even if I have a theory: are they discontinuing it? If you search on Amazon , you can see that the original 3DS is sold for $10 more than the MSRP and the giant 3DS XL has almost the same price. With the same price, everyone will choose the larger one, right? Short story: when the GameCube mic is connected to the Wii and you try to run unsupported games, they will hang at startup. 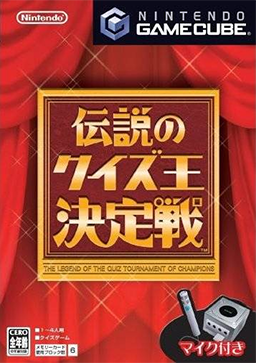 I also bought 伝説のクイズ王決定戦 （Densetsu no Quiz Ouketteisen - The legend of the quiz tournament of champions), a quiz with voice recognition where you have to say the right answer, in Japanese and without a list of "possible" answers. In the beginning, I only owned GameCube games: Wii games were "too new" and were starting from 2000 yen - $15, so I preferred to save money and buy 20 games for the same price - I didn't even have Wii Sports, as in Japan it's not bundled with the console. When I came back to my country, to play PAL games I installed the WiiKey. The problem is that the Japanese Wii works ONLY in Japanese. So, when on Waninkoko blog I read about his new Region Changer, I immediately using for changing the region to PAL. In the end, using AnyRegion Changer I fixed the problem, but I never managed to run any of my GameCube games anymore. Yesterday I told myself: "enough, there is no way to make them work", and, while I was disconnecting controllers and memory cards, including the mic (that's actually using the memory card interface). Just when I unplugged it, BOOM, the game started! I tried my games: all were working now!!! Moral: when the GameCube mic is conntect to the Wii (at least to mine) and you try to run a game that doesn't use it, it will hang at the booting logo. Yay, now I can play Donkey Konga ! It will have two 3D screens, with no need of special glasses!! Yes, you got it right, autostereoscopic 3D screens!! It's the SHARP screens that I mentioned exactly one year ago (for a cool coincidence, it was my first post on Dandandin.net!) about the new WOOO mobile. Last time that Nintendo tried to make a 3D portable gaming console, the 1995 Virtual Boy, it was an epic failure, but this time? In my opinion it would rock!